There is no magic lens that will enable us to look at — to see nature unclouded…uncolored by any values, hopes, fears, anxieties, desires, goals that we bring to it. In 2011, a known project and a secret hope brought me to the University of California, Davis (UCD), first as a visitor to a scientific visualization facility, KeckCAVES, and then as artist-in-residence at the facility’s neighbor, the Complexity Sciences Center. The known project had a title: Dream Vortex, and an adventurous form: an artwork made with interactive 3-dimensional projection. But the only words I had for the secret hope were from a language of “shamanism” imbibed from artist Joseph Beuys. 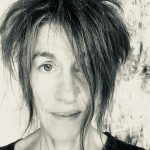 This essay follows the artwork and the hope as I groped my way forward, and tells how I found a better model than “shaman,” hidden in the history of science and revealed by clues in the Pavilions of the 57th Venice Biennale and the writings of Evelyn Fox Keller. My hope sprang from the belief that art, the domain of “subjectivity” — values, hopes, fears, anxieties, desires, and goals — and science — the domain of “objectivity” —consistent and repeatable facts and realities — needed to talk if we were, as a culture, going to arrive in a future we wanted to live in. But “domains” don’t talk — people do. Developing the artwork in collaboration with the UCD researchers would produce such talk, requiring interaction with them over time. I would talk with them about their dreams, make drawings based on the dream imagery, and feed them into a programmable, dynamic, vortex with which viewers could interact. At the end of the project, each dreamer would receive a drawing to complete the cycle of exchange. Through this work, I positioned myself as an intermediary between scientific and artistic worlds. The artwork would be a social structure that held both domains in dynamic relationship without blurring them, just as its visual structure, the vortex, whirled together distinct streams of research and imagination. A memory: in 1991, my MFA cohort stood in the ceramic glaze room at Mills College, listening to sculptor John Roloff. He waved his hand at the bins of powdery mineral colors. “We have all this,” he said, “because people need toilets. They’re not grinding up mountains for art.” His point, that art practice depends on an industrial base, stayed with me as I plunged into making art with media that barely existed at the time Roloff spoke. Historically, new technologies enable new art forms as they become widely available, as in the 1970s when the Sony Portapak triggered video art. I didn’t know it then, but 1991 was an important date in virtual reality, the year an effective 3-D display — more on that in a moment — was invented. That technology was expensive, and remained, for the most part, in laboratories, but two decades later, between 2011 and 2017, the video gaming market stimulated the introduction of home 3-D viewing systems. In 2011 sales of 3-D monitors, which could become interactive with the addition of gaming controllers, took off. [ii] In 2014, developer kits for the personal head-mounted 3-D viewer Oculus Rift became available; at this writing, consumer versions of head-mounted displays sell for around five hundred dollars. They are not in every living room, but they are showing up in major galleries and museums, for example as equipment in Carsten Höller’s 2015 exhibition “Decision” at the Hayward Gallery in London and as content in Nathaniel Mellors and Erkka Nissenen’s installation for the Finnish Pavilion at the 57th Venice Biennale. And they showed up, before they were commercially available, in the Complexity Sciences Center. [iii] As I worked on the Dream Vortex, translating it into each successive “wave” of interactive 3-D visualization technology, I felt the fitness of the common digital metaphors of “waves” and “surfing.” There were times when the ideas I stood on, from both contemporary art and its subset “art and science,” seemed awkwardly shaped for the turbulent conditions. I would wipe out if I fell into thinking “Art will fix science!” I was a guest in the laboratory and I respected my scientific collaborators. There was plenty of work to do on the Dream Vortex and, as time went on, its daughter vortices, that required no philosophical speculation. So the project moved along, with the question of how to interpret my own “dream” — the motivation for investing years in the project — bubbling under the surface. Then, seven years in, I reread Keller’s 1993 Refiguring Life: Metaphors of Twentieth Century Biology, in close proximity to viewing the 57th Venice Biennale, and out popped a much better model for my practice than “shamanism.” But I race ahead of the story. For the model to make sense, you need to know something of the Dream Vortex. Even if I had known that a “CAVE” was a “computerized automated virtual environment,” my first visit to UCD’s KeckCAVES would have been a magical shock. [iv] In a room-within-a-room — 3 walls and a floor equipped with stereoscopic displays and tracking devices— scientists interacted with images of their data in real time, “touching,” moving, and resizing 3-D projections as effortlessly as they might use a touch screen. Data from all kinds of studies, on subjects ranging from molecules to snowflakes to continents, was transformed into weightless, malleable imagery. It was like entering a room with physical objects and moving them around, except that you could also change their color, scale and position, orient them without regard for gravity, slice them up, and merge them. FIG. 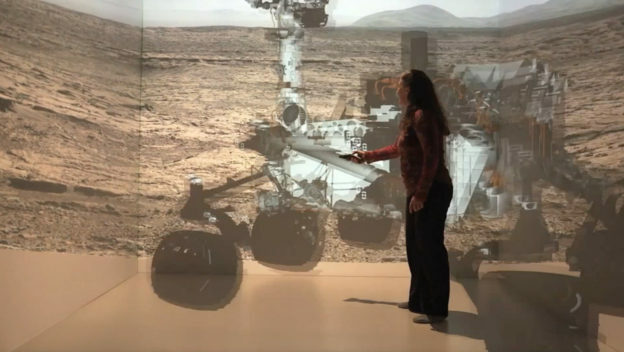 1 Still from Onward California video, showing Sumner in Keck CAVES with an interactive virtual model of the Curiosity rover on Mars, 2013. Within twenty-four hours of that first visit, an idea for a multi-dimensional CAVE work came to me; I turned it into a storyboard proposal and sent it off to KeckCAVES co-founder and geobiologist Dawn Sumner, who miraculously responded “yes.” We will turn to that proposal momentarily, but first a detour past a key question: Why did Sumner say “yes”? 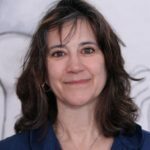 Why would a fantastically busy researcher —her work on early life, studying microbial communities in Antarctic lakes, had earned her a spot on the Mars Curiosity team and she was then a leader in the effort to choose a landing site— make room in her life to work with an artist? Sumner’s use of interactive visualization to explore her data with movement and proprioception required that she continually and creatively develop her use of the CAVE. Within my proposal, she saw a set of unfamiliar questions — an artist’s questions — but also a set of prompts for new movement possibilities. Imbuing the CAVE with the new movement functions for the artwork meant those functions would be available for science, too. The proposed work would mix old and new versions of human’s oldest imaging technology, drawing, transforming physical drawings into a spinning vortex of projected images with which participants could interact. A dream-appropriate degree of surprise, provided by a hidden network of associations built into the programming, meant that as viewers interacted with the piece, elements would occasionally morph, unbidden, into new images. That was the vision, anyway. Sumner’s “yes” came with a rider: despite my effort to frame the proposal based on the demonstrations I saw, I didn’t understand the technology very well and there was a significant gap between the capabilities of the extant CAVE programming and the artwork I envisioned. That gap was what appealed to Sumner. This is not the place for detailed discussion of the technical work that bridged it. Developing the new dynamics and interaction modes has engaged Sumner and others working to fulfill her design through more than five major programming stages. [ix] A sense of the distance we had to travel may be gained by contrasting our first prototype, a spinning network structure without images, with two stills from its current state. FIG 2. 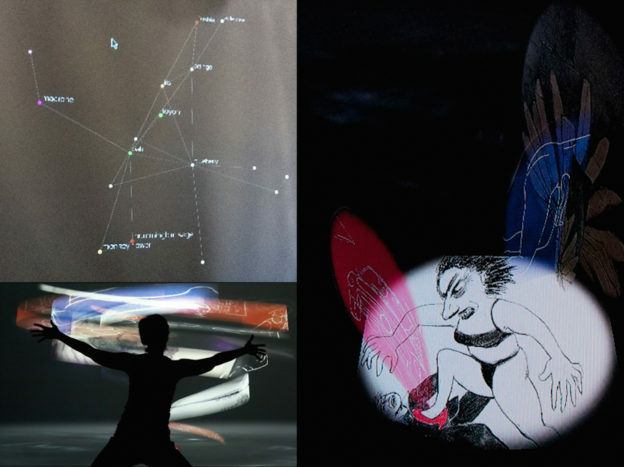 Dream Vortex: (Clockwise from upper left) Version 1.0, a dynamic network; Version 5.0, Choreographer Donna Sternberg improvising with 3-D projection of the artwork; Version 4.5, a viewer arrangement of dream imagery they selected from the artwork running on 3-D monitor. There was another challenge: the researchers using the facility were not eager to sit down with a strange person and tell her their dreams. This was, after all, their work place, and a site devoted to “objective” matters. Quite a number of them were interested in art, but what they meant by “art” was, to me, historical. This was the gap that appealed to me, a gap that could be gently bridged to increase the traffic between art and research. Help came from the Complexity Sciences Center, whose director, physicist Jim Crutchfield, had worked seriously with artists throughout his career. He provided the project with programming help, equipment, and a home base on campus. I started showing up in the lab, talking with people, working on the vortex, occasionally showing them works of contemporary art, becoming, in a small and quiet way, part of the lab.